If you have any question please message us.. 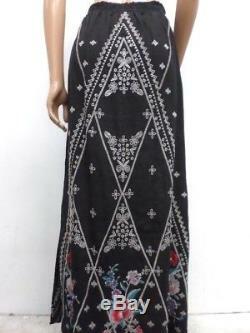 This is a comfortable, embroidered Eliza Linen Maxi Skirt from JWLA by Johnny Was. It features a shirred, elasticated 1.5 wide waist-line. Light gray geometric and floral embroidery design on front and back. Beautiful, multi-color floral embroidery near the hemline on the front and back. 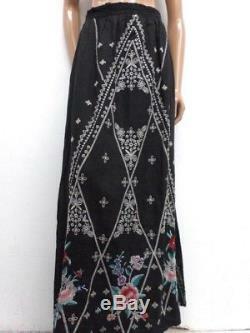 Maxi length hemline has 19.5 side vent openings. Women's Embroidered Linen Eliza Side Slit Skirt. Print: Solid with Multi-Color Embroidery. Info: Machine wash, cold water. Bust: 11.5" - 18" (Side seam to side seam). WE ARE NOT A WHOLESALER. The item "NWT Johnny Was JWLA Eliza Linen Maxi Skirt M OL11230618" is in sale since Monday, June 4, 2018. 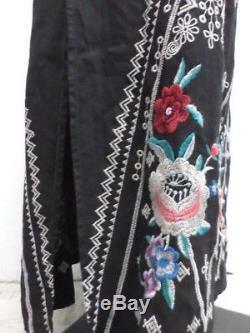 This item is in the category "Clothing, Shoes & Accessories\Women's Clothing\Skirts". The seller is "oliversfashionware" and is located in Los Angeles, California. This item can be shipped to United States, Canada, United Kingdom, Denmark, Romania, Slovakia, Bulgaria, Czech republic, Finland, Hungary, Latvia, Lithuania, Malta, Estonia, Australia, Greece, Portugal, Cyprus, Slovenia, Japan, Sweden, South Korea, Indonesia, Taiwan, South africa, Thailand, Belgium, France, Hong Kong, Ireland, Netherlands, Poland, Spain, Italy, Germany, Austria, Israel, Mexico, New Zealand, Philippines, Singapore, Switzerland, Norway, Saudi arabia, Ukraine, United arab emirates, Qatar, Kuwait, Bahrain, Croatia, Malaysia, Brazil, Chile, Colombia, Costa rica, Dominican republic, Panama, Trinidad and tobago, Guatemala, El salvador, Honduras, Jamaica.